HB White Canada Corp. selected Motor City Electric Utilities Co. (MCEU) and Mid South Contractors ULC (MSC) to perform complete electrical contracting for NextEra Energy’s 129MW Summerhaven Wind Farm in Ontario’s Haldimand County. The location provides excellent wind currents due to its proximity to Lake Erie. MCEU and MSC are wholly owned subsidiaries of Motor City Electric Co. MCEU specializes in utility work including substations, transmission and distribution, street lighting, and similar projects. MSC, based in Windsor, Ontario, is MCE’s base of operations for projects in Canada. The Summerhaven project included construction of approximately 60 miles of underground collection cabling, a 7-­mile long 230kV transmission line, a new 230-­34.5kV collector substation, and wind turbine generator (WTG) work for 56 Siemens 2.3MW turbines. After surveying located the electrical lines and the on-­site substation, access roads were constructed, and foundations were poured, MCEU constructed the on-­site substation and the attached operations building. Substation equipment includes a main isolation switch and main circuit breaker, step-­up power transformer/distribution switchgear, instrument transformers, grounding, high voltage and low voltage circuit breakers and disconnects, and revenue metering. 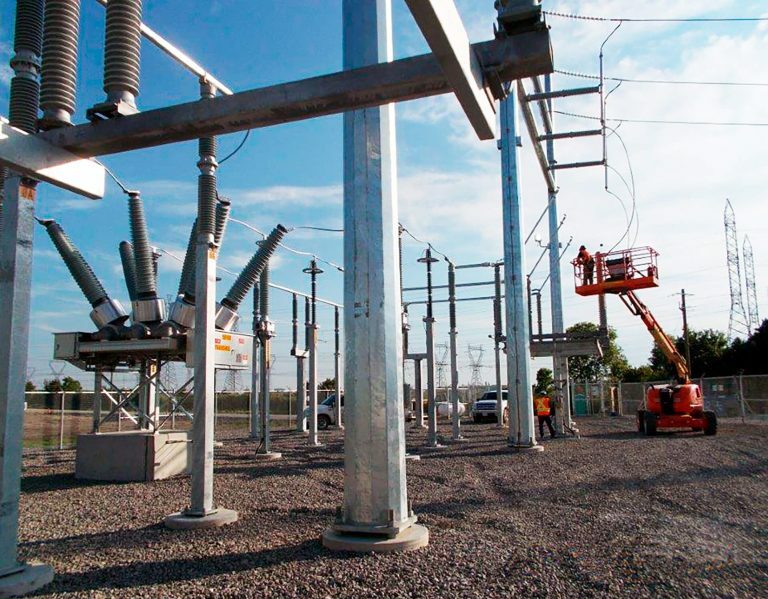 Adding to the complexity of the project, the substation needed to be connected via overhead transmission lines to the main 230kV Hydro One Networks Inc. (HONI) transmission line via a switchyard area. The switchyard area contains both a Summerhaven switching station and a HONI switching station that includes three separate buildings and connects to the main circuit. This required careful and well-planned coordination between MCEU, HONI, and HB White. The collector system is an underground network of 34.5 kV standard utility cable interconnecting the individual turbines and connecting to the substation. The installation of the collection system cabling and overhead transmission line was completed over a 2-­3 month period. MCEU trenched most of the cable rather than running it on overhead poles to help minimize any loss of arable farmland. The 7-­mile long 230kV overhead transmission line was installed on poles by MCEU using a truck-­mounted auger and a crane. A boom truck was used to ensure that the poles were ready for conductors, and cable reel trucks were used to string cables in place. Horizontal directional drilling was employed for crossings close to a body of water or a natural feature to reduce negative environmental effects. The project includes three meteorological weather towers that monitor wind speeds. For safety, the turbines automatically shut down if wind speeds exceed 55 MPH. A secondary containment system was installed around transformers to control contamination in the event of a leak.